Electrons (blue) and positrons (red) from a computer-simulated pulsar. New research led by NASA astrophysicist Gabriele Brambilla shows the paths taken by charged particles caught in the magnetic and electric fields near pulsars. The work is based on a new way of modeling pulsars, and it’s offering an unprecedented glimpse into the inner workings of these exotic celestial formations. 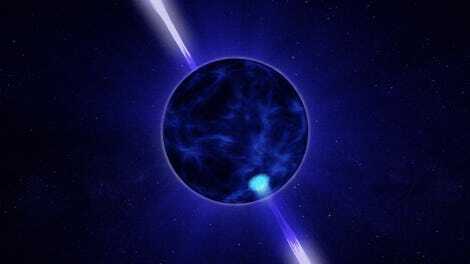 Pulsars are the smushed remnants of massive stars that ran out of fuel, collapsed, and then exploded as a supernova. These whirling neutron stars pack a horrendous amount of mass into a small space; a typical pulsar is about the size of Manhattan, yet it contains more mass than the Sun. As they spin—often a thousand times per second—they exert the most powerful magnetic fields known to astrophysicists. At the same time, strong electrical fields tear away at particles on the neutron star’s surface, flinging them into space. From Earth, we can see a pulsar’s rotating beam of gamma rays and radio pulses at exquisitely regular intervals—an effect that’s often compared to the pulsating beam of lighthouse beacon. Pulsars are like gigantic particle accelerator experiments floating in space, and they produce a lot freaky physics, both at the micro and macro scale. Astronomers have been studying pulsars for over 50 years, but they’re still not able to fully explain what they’re observing. Needless to say, we can’t create these extreme conditions on Earth, nor are we able to observe these objects from up close, the nearest of which is about 770 light-years from Earth. That’s why Brambilla and her colleagues turned to computer models to learn more about pulsars and how they affect the behavior of charged particles. NASA Goddard video showing the pulsar simulation. For the new study, published this week in the Astrophysical Journal, the scientists turned to a relatively new way of modeling pulsars— a simulation system known as PIC, or particle-in-cell. The PIC simulation was performed on a pair of NASA supercomputers: the Discover supercomputer at NASA’s Center for Climate Simulation, and the Pleiades supercomputer at the Ames Research Center in California. 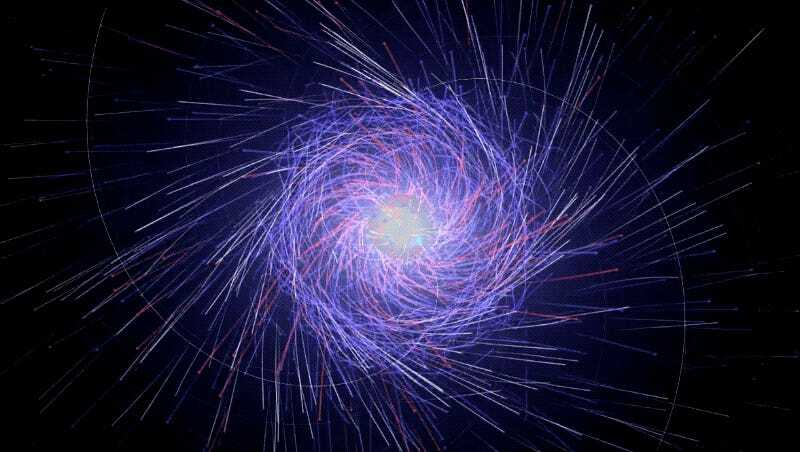 Incredibly, the PIC model tracks the movement of each particle, which collectively represent trillions of electrons and their anti-matter counterparts, positrons. If this sounds a bit cryptic, I highly recommend that you watch the visual simulation (shown in the video above) produced by NASA Goddard, which illustrates these processes rather nicely. It’s easy to understand why physicists get so excited about pulsars, but astrobiologists and SETI scientists may find them valuable as well. Research published last year proposed that advanced aliens are more likely to build energy-collecting megastructures around pulsars than regular stars. The reason is that pulsars concentrate their energy in discrete beams, as opposed to scattering them in all directions, as most stars are wont to do. Anyhoo, Brambilla are her colleagues are hoping to conduct further simulations of pulsars in order to gain a deeper understanding of their intense magnetospheres, and how pulsars might differ from one another.